The Buzz Piece » Italian Film Festival ‘Italia Festa’ starts Today in South Florida!! HomeTravelItalian Film Festival ‘Italia Festa’ starts Today in South Florida!! Jun 03 Italian Film Festival ‘Italia Festa’ starts Today in South Florida!! A conversation on Italy is never complete without the mention of their gourmet Italian cuisine, Italian sparkling wines and the award winning Italian films. In no specific order; that is. And now you can savor all three at the Italia Film Festa. Fort Lauderdale International Film Festival, (FLIFF as it is called) is coming up with the first annual Italia Festa starting this Thursday. It’s a 5-day film festival celebrating 60 years of Italian Cinema with an eclectic mix of classic and contemporary. Films that are considered major crowd pullers in this festival are Oscar winning IL Postino and Mediterraneo, both of which won Academy Award in Best Foreign Film category in 1994 and 1991 respectively. 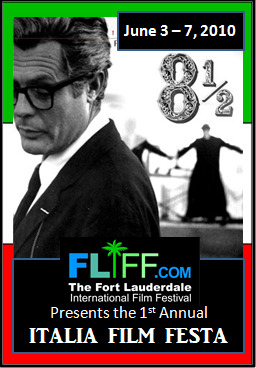 The closing night movie is Federico Fellini’s highly acclaimed 81/2 starring Marcello Mastrianni as Fellini’s alter ego. Many believe this classic 81/2 is one of the top ten movies ever made in the history of cinema. There will also be children’s program like Fab, along with many kid’s movies showcased to make this an all rounded event. Italia Film Festa takes place from Thursday June 3 to Monday June 7 at Cinema Paradiso. And FLIFF members get to see all 60 movies at the discounted price of $75 including meals and before – after parties. In the same context, International movie lovers are also looking forward to the 8th Annual French Film Festival coming up in Miami by the end of July this year. Fantastic – absolutely fantastic! I enjoyed this – great topic, well-crafted article.